ix days a week, Larry Suvak opens a padded case on his sailboat. 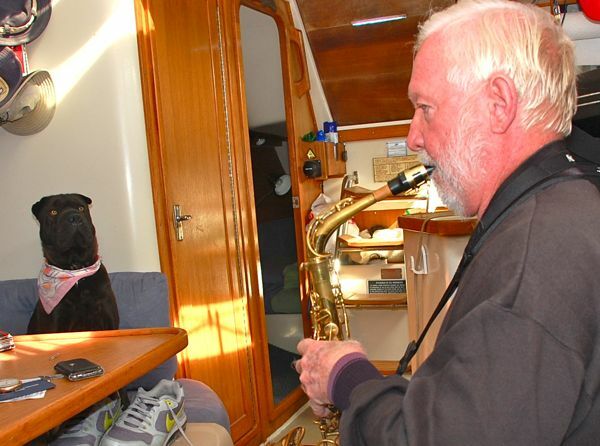 He takes out a musical instrument and his dog Tiani jumps on the berth across from him. At 9:30a he begins playing. “I go to work” he says, “and Tiani goes to sleep.” For knowing how to soak up a good shipboard jam session – be it saxophone, clarinet or flute – TownDock.net names Tiani Pet of the Month for January. Tiani. Her name is pronounced “chya nee”, emphasis on the first syllable. Larry says “tian” means velvet in Chinese. He added the “i” to the end saying it makes the name easier to hear when called. 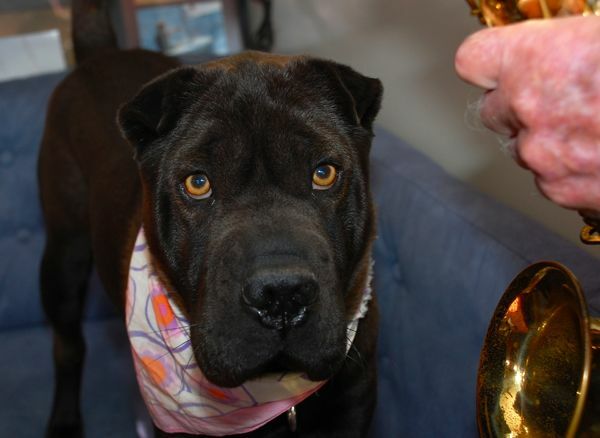 Tiani is a Shar Pei, a Chinese breed. Young dogs, before they grow in to their skin, are known for the furry folds that cover their face. Tiani is 2 1/2 years old. Her wrinkles have smoothed out. These days its her radiant yellow eyes and triangular ears – not baggy skin – that dominate her face. Those ears have heard a lot of music. Home sweet boat – Larry’s Catalina 32 Dragonfly. He’s owned the sloop since 2007. Larry is a theater musician. He has worked with artists including Jerry Lewis, Lou Rawls and Aretha Franklin. His specialty is woodwinds. He plays almost daily to keep in practice. 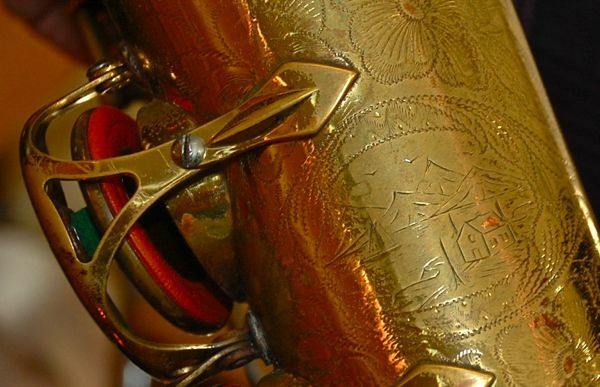 Playing an instrument in a marina – especially an alto saxophone – poses acoustic challenges. Rather than wake fellow boaters with an early morning blast, Larry and Tiani have adopted a routine that combines caffeine, strolls and scales – all in the name of musical and maritime peace. From Sailcraft Marina, where they live, Larry and Tiani often stroll to the town beach. They might swing by the Bean. Or circle back along the river to the Marina. Which ever route they choose, they need to back at the boat by 9a. That’s when the jam session starts. Tiani lives aboard with 9 instruments. Larry practices the clarinet, saxophone and flute most often. Getting Tiani to appreciate his largest instrument took a while. 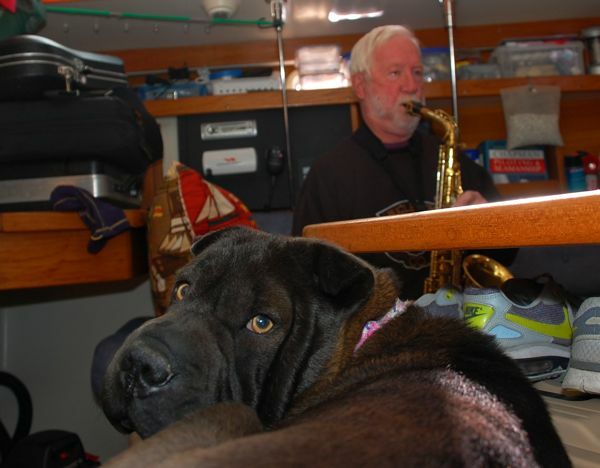 Larry says, “When I first started playing the sax, she would go to the bedroom.” – the sailboat’s aft cabin. He thinks the sound may have hurt her ears. Or maybe she just wasn’t used to it. After a while, it bothered her less. She took to curling up on the berth opposite him and went to sleep. There’s still one instrument Tiani isn’t fond of. “She doesn’t like the piccolo,” Larry says. “It’s an octave higher than the flute.” The high sound might be displeasing to her ears. 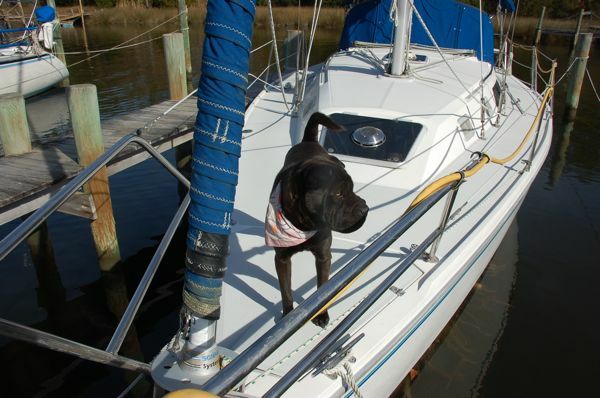 Tiani’s favorite seat in the house – er, sailboat – is the starboard berth. For the most part she sleeps through the music, raising her head only if she hears a strange noise. “When she hears the music stop,” he says, “she’ll lift her head to see what I’m doing.” If he’s hungry, Larry eats a banana. If the weather’s nice, Tiani goes on deck. Afternoons, Tiani enjoys socializing with folks visiting the marina. The bow pulpit makes an especially vantage point. She’s a big fan of Mungo the cat who lives with Chris and Sue Loprete aboard “Nereus”, a nearby Heritage 46 sloop. 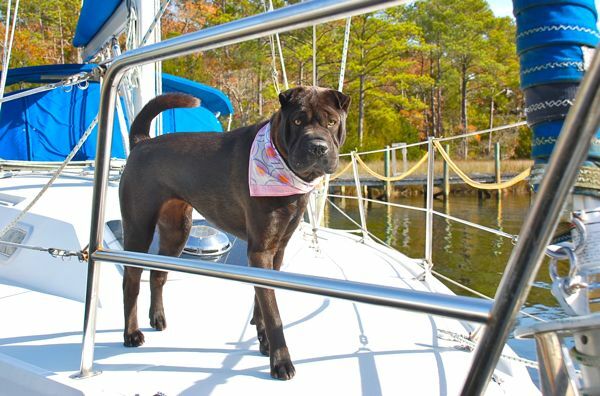 She also enjoys visiting TownDock.net Pet of the Month Sadie aboard the houseboat Island Time. In hot weather, Tiani enjoys lounging in the shade of the dodger. When it’s cold, if it’s calm and the sun’s shining, she luxuriates on the sloop’s side deck. Here, she’s in greeter mode at the bow. 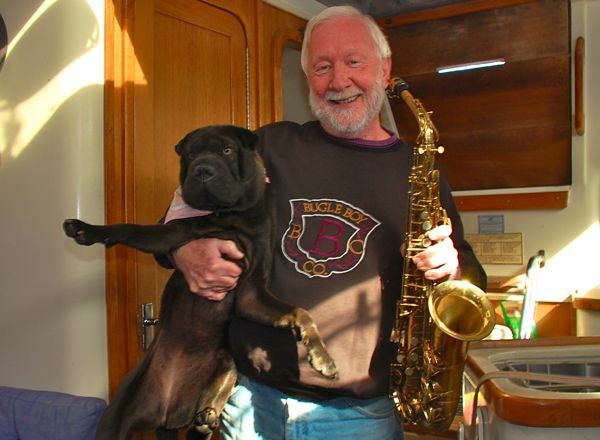 It’s an unusual mix for sure – a dog, a boat and a saxophone. But on a quiet morning up Whitaker Creek you might hear it. A jazzy riff drifting from a sleek white sloop. Followed by a bark. To listen to Larry playing Tiani a tune on his sax – complete with creaking boat noise – click on the audio player.